Place the Rattleback on a hard, smooth, level surface with the elliptical side down. Lightly tap one end and notice which direction it rotates. Now try to spin the Rattleback in the opposite direction! 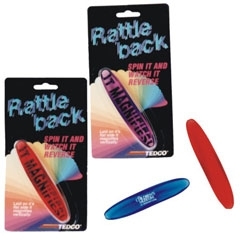 Due to its offset center of gravity, the Rattleback has a preferred direction of rotation. It wants to spin counterclockwise. Its spin bias is so strong that it will turn through a few revolutions, stop, 'rattle' or rock up and down on its long axis and then automatically reverse itself and spin counterclockwise.